This inventive brew brings all the flavor of the classic hard-coated custard dessert into a creamy, dreamy beer. Brooklyn Lager is Brooklyn Brewery’s flagship beer. It is loosely based on the old Vienna lager style, derivations of which were popular in parts of the United States in the late 1800s. Its bitterness is snappy, with a firm malt core, and the beer is dry hopped. 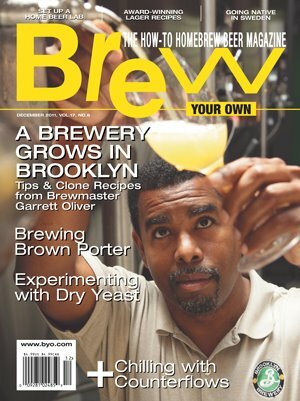 Discountinued in 2013, Brooklyn Monster Ale was first brewed in 1997 and was a legend in its time as one of the early American-brewed barleywines. It was midway between the old British barleywine style and more modern variants. Much of this beer’s essential character comes from the use of Maris Otter floor malts, but the residual sugar was relatively low. Recipe was created by Zoo City Zymurgist member Bill Ruediger, who won the Community Brew contest hosted by Big Sky Brewing Co. The winner of the contest brews a commercial-sized batch at Big Sky. The beer’s proceeds were donated half to the brew club and half to a charity of the club’s choosing. Bill’s winning beer was inspired by a chocolate coconut porter at Maui Brewing Co. fresh off the taps. It took him eleven batches to finally find the winning combination. This beer scored a 47 at the Indiana Brewers Cup, out of 1,071 entries. A Munich Helles recipes that scored a 46 out of 50 at the Indiana Brewers Cup among 1,071 entries.